How flooding the Russian River might be our best chance to beat the drought. This is today: Groundwater reserves are shrinking. Wells have dried up. Saltwater is encroaching into the Carneros Valley. Tributary streams where salmon and steelhead spawn have vanished, and state efforts to stabilize groundwater use are moving at a glacial pace. Then, when it finally does rain, vast deluges of freshwater gush down the Russian River, swamping the towns that abut it but quickly vanishing out to sea, providing little lasting relief for our most over-drafted aquifers. But Don McEnhill, who lives his life thinking about water, has a plan for tomorrow. 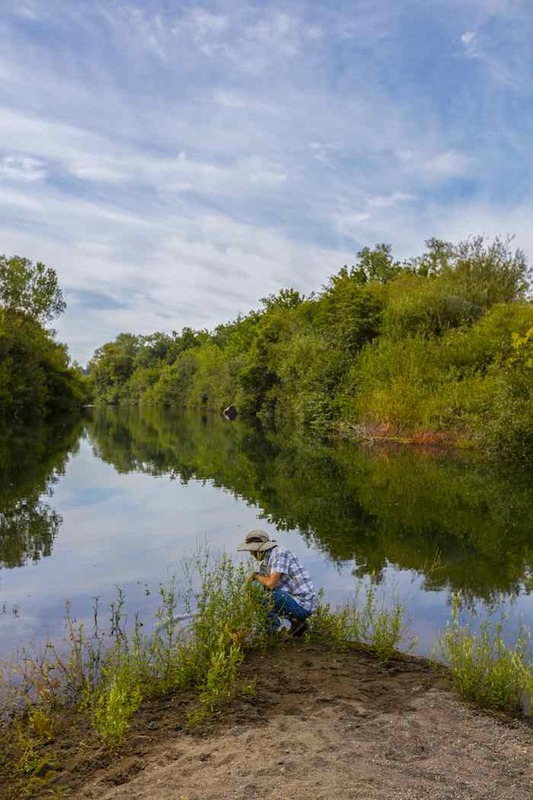 The executive director of the group Russian Riverkeeper, McEnhill wants to undo decades of land development work and return the Russian River to a state of nature. The idea is to knock down riverbank fortifications and levees and let the river behave as it once did, routinely flooding each time rain falls. This, McEnhill says, would actually reduce the severity of extreme floods by allowing water to sprawl gently across uninhabited places rather than burst all at once into towns. It would also create food-rich wetlands for fish. But, perhaps most importantly, the concept that McEnhillenvisions would allow precious freshwater to sink into the ground and into depleted aquifers. “If we can let that water sit out there on a floodplain for just minutes, recharge goes from zero to 10 percent of that water, and a few days on the floodplain gets you to 60 or 70 percent,” he says. That means that the vast flood of water that roared through Healdsburg last winter, if it had only had a place to lie for a few days, would have mostly sunk into the ground, beefing up our water supply against years more of drought. Instead, most of the water went gushing out to the Pacific Ocean. McEnhill hopes to convince city managers to build retention ponds to catch runoff and farmers to open up their land to temporary flooding. “We want to make groundwater recharge the number one climate change adaptation priority in the county,” McEnhill says. State officials already are thinking hard about California’s groundwater supplies. Legislation passed last year mandates local governments figure out how to sustainably manage their own aquifers. Part of this strategy will involve regulating well drilling and groundwater pumping. Currently, groundwater is practically as available for use as the air we breathe—an unregulated resource. But the trouble with the state’s plan is its time frame: Local governments are supposed to create their own team of groundwater experts by 2017, and groundwater sustainability must be achieved by 2042. In parts of Sonoma County, there may not be that much time. Wells have already gone dry, and three of the county’s 14 main groundwater basins—the Santa Rosa Plain and the Sonoma Valley and Petaluma Valley basins—are considered to be at particular risk of being depleted. Much of the water is being used up by farmers who have drilled thousands of wells to irrigate vines and other crops. But another problem affecting the region’s fish and hydrology is the simple fact that the Russian River no longer flows as it naturally did. A century ago, the Russian overflowed its banks many times through most winters, inundating thousands of acres of floodplains and creating ephemeral habitat for birds, microorganisms, and fish. Much of this slow-moving water also sank into the ground and recharged aquifers. The river has since been channelized—”straight jacketed,” as hydrologists sometimes say—between two riverbanks like walls. This has made the river flow deeper and faster than before. It also causes the river to carve away its own bottom, dropping the water level below the surrounding land. This means that, except during exceptional rain events, the river almost never floods. Instead, the Russian River’s water gets carried swiftly from land to sea. This artificial system looks neat and tidy from an engineering point of view, but it is destructive in many ways. And it certainly does no favors for groundwater basins. “Every time we have less than normal rainfall, we pay dearly for channelizing our creeks and rivers,” McEnhill says. Another benefit of restored floodplains is bigger, more abundant fish. 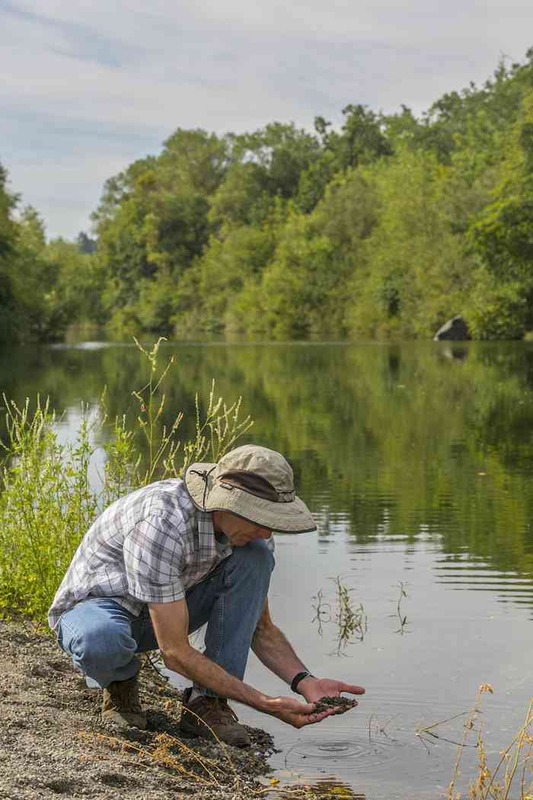 Jacob Katz, a Guerneville resident and a biologist with the group California Trout, explains that when river water slows down and disperses across a shallow area, it works like a huge solar panel: Sunlight that hits the water sparks explosions of life, which in turn supports the entire aquatic food web. 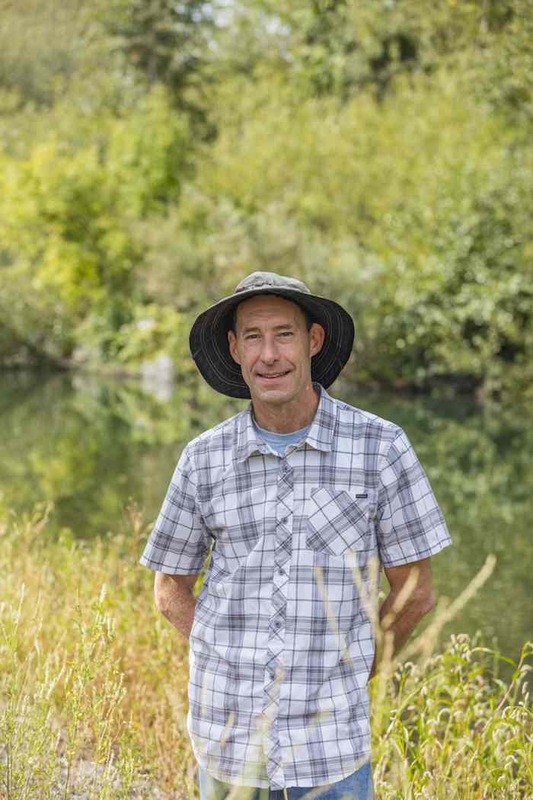 For baby salmon and steelhead migrating downriver from their birth streams, such habitat provides a very valuable forage and refuge zone, says Katz, who has closely studied how inundated wetlands in the Sacramento Valley improve the survival rates of recently born Chinook salmon. Katz believes the Russian River’s struggling Coho salmon and steelhead runs will never rebound if the river, from its headwaters to the lower floodplains, is not allowed to function as it did before it was tamed with dams and levees. While dam removal is an unlikely prospect of immense political and logistical weight, there are thousands of acres of floodplain now disconnected from the river that could easily be reconnected by notching levees and discontinuing riverbank stabilization efforts. “Getting water back onto the floodplains would be the biggest win-win-win for climate change adaptation,” McEnhill says. Many government officials are on board with the program. “Experiments in flooding land in the Central Valley have shown success in recharging groundwater,” says Sonoma County Water Agency chief engineer and director of groundwater management Jay Jasperse. Only some areas are suited for such recharge methods. In the Sonoma Valley, dense clay soils in places prohibit percolation of water into the earth, Jasperse says. For such regions, direct well injection might be a more effective method. That is what Tito Sasaki, president of the Sonoma County Farm Bureau, wants to see done, especially in urban areas like the town of Sonoma. “We could take that winter surplus and inject it back into wells,” he says. Supervisor James Gore believes riverbank recharge programs could help bolster groundwater supplies while also protecting natural resources, and increasing reservoir storage space could be another tool in the toolbox. But, he says, just as important as increasing and maintaining supplies of water will be to permanently reduce demand. “We don’t need lawns in the future in Sonoma County,” he says. “I hope that in 20 years we won’t see any more green lawns here.” He calls “aesthetic or convenient uses of water” the most wasteful applications of the resource and ones that must be eliminated—replaced, we can imagine, by brown lawns and drought-tolerant landscaping. Gore says ensuring that people have water to drink and that fish, like the Russian River’s salmon and steelhead, have water to swim in should be considered top water-related priorities. 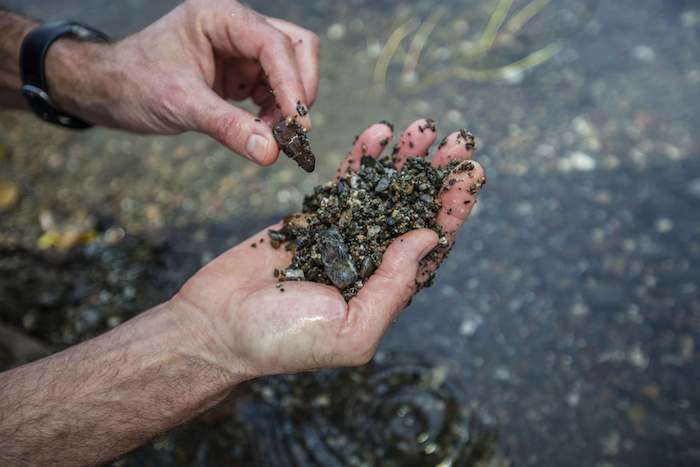 In rural regions, old gravel pits along the Russian River, and even the county’s revered grapelands, could double as fish nursery grounds and aquifer recharge ponds. “There’s some real potential to do this on vineyards, since grapes really don’t mind getting their feet wet,” Katz says. So, how much groundwater do we have left? That isn’t clear. Property owners must apply for permits to drill wells, but they don’t need to report how much groundwater they’ve used. This makes it hard for water managers to keep track of groundwater use. Worse, it complicates efforts to track and manage surface water use since, in many places, groundwater reserves are simply subterranean extensions of a river or lake. Drilling a well into such groundwater basins is, in effect, no different than dipping a pump and hose into a river or lake. In spite of the prevailing media narratives about water and the drought, not all farmers are particularly worried about groundwater levels. “It’s not like we’re out of water,” says grape grower Doug McIlroy. McIlroy says that he is more concerned about higher-elevation streams, where vanishing flows have left salmon and steelhead spawning beds high and dry. He feels Sonoma County is wet enough, even in dry years, that the region bears resilience against drought. “It’s not like the Central Valley, where it’s drier and groundwater levels are more overdrawn, and there are more farmers,” McIlroy says. Whatever efforts are taken to alleviate the strain on aquifers, they must be taken soon since over-drafting a groundwater basin can cause irreversible damage. Saltwater may creep inland to fill the empty space. Jasperse says this is happening at the interface between San Pablo Bay and the freshwater basins just to the north. Just as bad, the land may subside. The San Joaquin Valley provides a dramatic example of this phenomenon, in which the ground level has dropped more than 20 feet in places as farmers pump water from the ground directly below them. In either scenario, the underground storage space for freshwater is lost. After four years of drought, relief for the parched West Coast could be on its way. Climatologists are predicting a massive El Nino event this winter, which could provide enough rainfall to mostly refill aquifers. McEnhill wants to see county officials get to work now building retention ponds and flooding basins in order to maximize recharge benefits. McEnhill says securing money from the Proposition 1 water bond passed by voters in 2014 will be an important step in making alterations to the river’s bank and its floodplains. Finding money, McEnhill says, is one of the hardest parts of river restoration, while the fix itself, in this case, seems exceptionally simple: The Russian River must be able to act like a river again.